Greece, late Hellenistic period, ca. 1st century BCE. A fabulous ensemble of two circular roundels, each presenting with a raised rim and pale-orange slip. 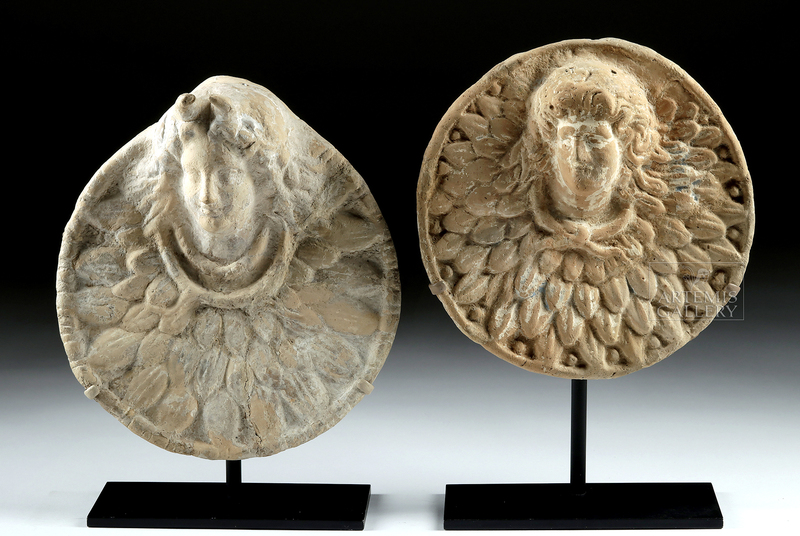 The roundels boast projecting relief busts of youthful divinities, perhaps Medusa, surrounded by a broad collar composed of dozens of triangular scales with central ridges. The smaller roundel features a right-facing head with piercing eyes, a puffy coiffure, and knotted cloak strands, and the larger roundel exhibits a more feminine visage framed by two necklaces and surmounted by a pair of curved horns. 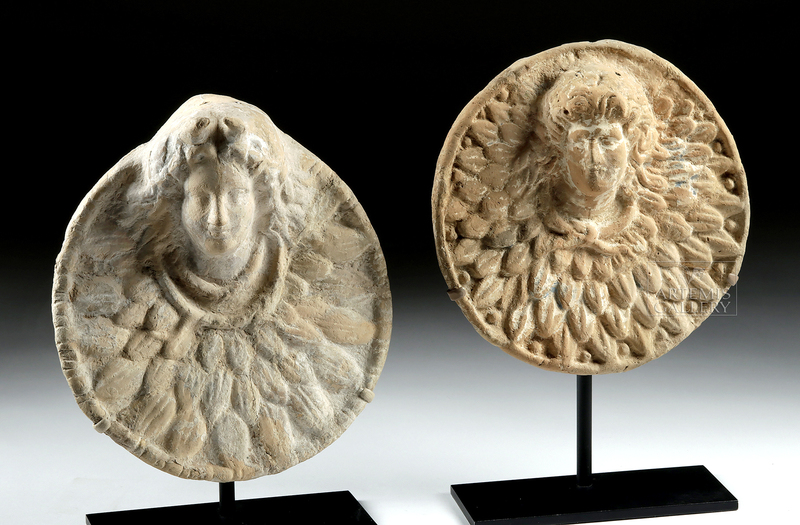 Hellenistic figural busts like these examples were inspired by the many regal portraits of Alexander the Great, though such meticulous stylization could be applied to both male and female subjects. Traces of original white pigmentation are visible across both items, and small areas of aqua-blue pigment are scattered across the front of the smaller roundel. 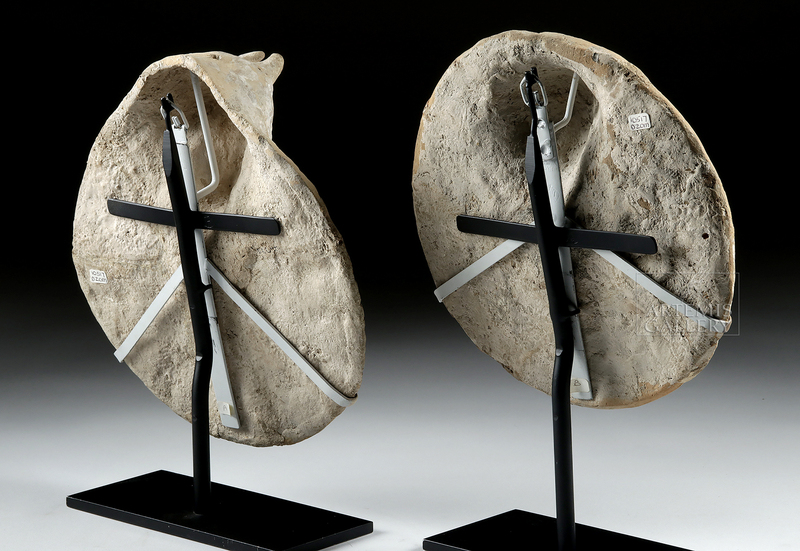 Custom museum-quality display stands included. Size of largest (horns): 8.1" W x 8.625" H (20.6 cm x 21.9 cm); 10.25" H (26 cm) on included custom stand. 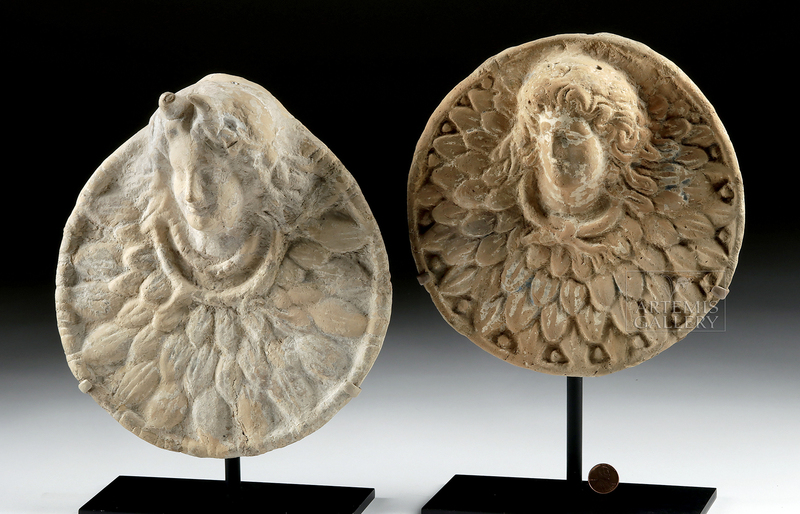 Published in "Our Collective Past: A Selection of Objects from Antiquity." Fortuna Fine Arts, Ltd., New York, 2006, fig. 8. Condition: Both roundels repaired from multiple large pieces, with restoration, resurfacing, and overpainting along break lines. Both items have minor nicks and abrasions to discs, heads, and versos, with softening to some finer details particularly around the faces, fading to original white and blue pigmentation, and light encrustations. Nice traces of original pigmentation along obverse sides, and nice earthen deposits throughout. Old inventory labels behind both roundels.